Protecting yourself needs to be priority number one all year ‘round, as UV rays not only burn, but age the skin. There are even bigger consequences to sun damage too. Apply sunscreen all over and let it dry before you put on your clothes. However, one application won’t last you all day. Keep a small tube in your handbag for re-application throughout the day. Another excellent item to have handy is a lip balm with SPF 15 or higher. The sun is incredibly damaging to the delicate tissue of the lips, and can also dry them out quickly. Add a wide brimmed hat to your outfit if you’re spending the day outside – big hats are so hot right now (pun intended), and protect your face from all angles. Check out the Cancer Society SunSmart information, which is all about making sure that you ‘slip, slop, slap and wrap’. Acne seems to be inevitable when we get hotter, sweatier, and oiler. But there is no need for elaborate treatments with millions of steps. No matter where it crops up, treat it with a cleanser that contains either glycolic acid or salicylic acid. 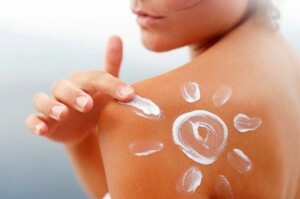 In summer, it is best to check that anything you put on your skin is oil-free. Anything oily will just clog up your pores and cause more acne. Extra oil, heat and sweat are a fact of life in summer, but you still don’t want your skin to dry out. Over-drying the skin is only going to make any breakouts worse, and harder to control. Use a gentle toner, and opt for a light, water-based moisturiser. Use it sparingly, as you’ll only need enough to keep skin hydrated. Unfortunately not all makeup is made for hot summers, so it is best to choose your products wisely and keep it light. One option is to skip your base entirely and just do some spot-concealing. As well as looking more natural (and therefore gorgeous), you won’t have to worry about foundation coming off with sweat. Use an oil-free tinted moisturiser if you’re not comfortable going ‘naked’. Tinted moisturisers even out skin tone, and are a handy two-in-one product to have in the makeup bag. SPF 15 or higher is an added bonus, and makes the product even more versatile as a three-in-one.